Dirk Berkson, Animal Psychiatrist- Digital Collage 4" x 4"
The serialized Adventures of Dirk Berkson, Animal Psychiatrist ran in Argosy magazine between 1903 and 1909 alternating every other week with Edgar Rice Burrough's Adventures of Tarzan. Although Tarzan remains firmly planted in the american collective memory, in its day Dirk Berkson held a place of equal prominence. Part Classic Comics, part Cliff Notes cloaked in an adventure story, the series enjoyed enormous popularity among undergraduates and New York intellectuals.If Tarzan epitomized the Age's Noble Savage, then Dirk embodied the emerging Savage Intellectual. Whereas Tarzan turned his back on all the trappings of civilization when he entered the wild, Dirk dispensed the latest in psychoanalytic theory to civilize untamed nature. In one memorable episode Dirk thwarts a bear attack by invoking Freud's essay on ambivalent emotional attitudes from Totem and Taboo; Some Points of Agreement Between the Mental Lives of Savages and Neurotics. 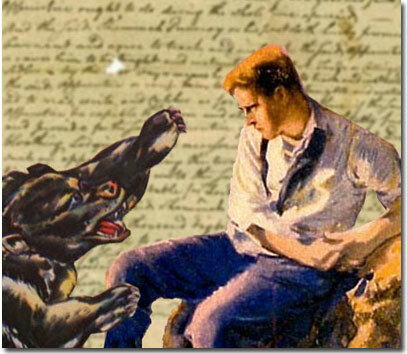 Many loyal readers claimed the series lost steam in 1908 when Dirk's faithful wolf, Adler terminated psycho-analysis after a breakthrough that ended its years-long obsessive need to lick itself. Once Adler moved on, Dirk's adventures seemed lifeless case studies in neurotic behavior. The final issue ended with Berkson returning to New Haven to resume his private practice, looking for all the world civilized, but feeling forever wild at heart.